Since posting this cake, I’ve had several people asking about the icing. Here is the recipe that I use. Place 1 cup sugar and water in a small saucepan. Boil over medium heat until it reaches 245 degrees (using a candy thermometer). After it has started cooking (about 175 degrees for me), start the meringue so it’s ready when the syrup is done. 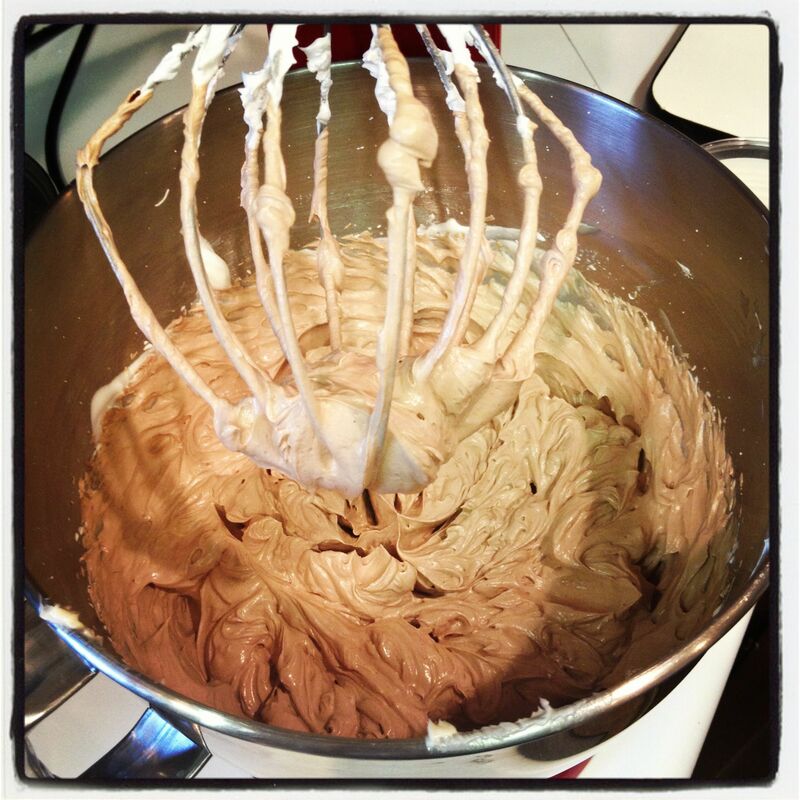 Whip the egg whites in a stand mixer with the whisk attachment on high until they reach soft peaks (about 1-2 minutes). Stop mixer and sprinkle with 1/4 cup sugar. (This keeps you from overbeating the egg whites). Beat on high. Once the sugar syrup is ready, slowly pour a steady stream of the syrup into the mixer while still beating on high. Continue doing this until all of the sugar syrup is added. Continue beating on high for 7-10 minutes, until the outside of the mixer bowl is room temperature. With the mixer still running on high, beat in the butter a tablespoon at a time. Wait 5-10 seconds between each addition. Once all of the butter is added, continue whipping to the right texture. When you add the butter, it WILL deflate your icing. Don’t panic! That’s what it’s supposed to do. Just keep whipping. If your icing looks more like soup than icing after adding the butter, again don’t panic! It’s just too warm. Just place the mixing bowl in the fridge for 10-15 minutes to firm it back up. Then whip it again on high and it will fluff back up beautifully. If you icing looks like cottage cheese, don’t panic! Just keep whipping. The original recipe calls for 4 sticks of butter, but I don’t miss that extra stick so I just use 3. You can try it with 4 and see if you notice a difference. Then, you will have this. Pure. Magic. 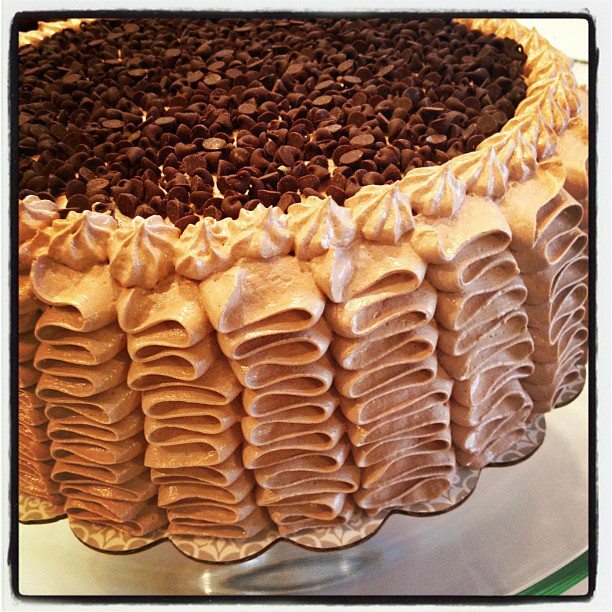 So, go make yourself a cake and cover it with Italian Meringue Buttercream! You’ll be glad you did. Yum. I love making Italian Meringue buttercream.! I want to experiment around more with different flavors. I love making this icing, but it tends to turn off white rather than white. Can I add cream of tartar or 3 sticks of butter to keep it from turning off white? I usually use 3 sticks of butter instead of 4, and I still find it not white white. I haven’t tried the cream of tartar, so I’m not sure. I wonder if you could also add the bright white coloring? I do that with my royal icing to make it a nice, crisp white. I haven’t experimented with that for IMBC. Might we worth a try. It may just be like regular buttercream. If I use butter, I don’t get super white icing. I have to use shortening for that. So, it’s possible that whenever you use butter for icing (whether BC or IMBC), you just have to not have white icing, know what I mean? Good question though. I’ll have to play around with it. Thanks! try ” white white ” coloring from wilton its works for me all the time! Great idea. I use AmeriColor “Super White”. Great stuff! I made an italian meringue just now and i was wondering if i dont get to the 245 degrees (iwas probably at around 220) will it make a difference in the ending frosting? Yes, the temperature makes all the difference. This is essentially a divinity recipe with butter added at the end. If you don’t get it to the right temp, the frosting won’t set up. Thanks for the replies guys! To be honest, I have never gone under 245 so I wasn’t certain of the science behind it. Ag – Did you notice that it didn’t set up with the lower temperature? Dunno…..I am tired and drugged,,,,,,,,ZzzzzzzZZzzzzz……..
Altitude makes a big difference on what the temperature needs to be. I live at a high altitude so I need to lower the temperature by 9 degrees. If I cooked this to 245 degrees it would turn out hard. You need to subtract two degrees Fahrenheit from a stated temperature for every 1000 feet you are above sea level. So i need to cook this to 236 degrees F. You can find info on this on the internet. This also applies to baking. You need to adjust your recipes if you live 3500 ft above sea level, using less leavening agents, more flour, etc.